To you. . . From the other side. . .
T. S. Eliot, from "Four Quartets"
The day will finally arrive. It may come early in life or it may be the last day of your life, but sooner or later you will ask some very simple questions, to wit What does my life mean? Why am I the way I am? When we ask those questions we are pondering the essential mystery of life, and the more we probe that question, the more insightful and perceptive we become, and the more mysterious and full of faith our answers become. Ponder these questions long enough, and when you arrive at the most cogent answers, do not be surprised to find music defining your essential being. Be warned only the fool will try to define himself only with words. Music is at the center of everyone's soul. Can there be ecstasy without confronting death? Is it a dream? Is the world a great complex machine that is constantly renewing and destroying itself and music the lubricant that keeps the machine going? The harder the machine works, the tighter the gears get, and the more lubricant is needed to keep the machine going. I was just born and am in my mother's arms. Her singing voice falls warmly over me as she rocks back and forth. Watching someone die brings us to the ultimate vulgarity. In the end, we are nothing more than a pile of quivering flesh. Coughing, rasping, gasping, smelling, twitching; the frail blotted flesh, the last touch of hands, the meeting of eyes, and it is all over. You look upon a vacant body and you wonder where it all went. What happened to that person you once loved? This vacancy is terrifying because it shall soon be mine. Who wants to be a lifeless mound of worm fodder? I've known since I was a little boy that the grim reaper is playing by my side. Time is running out for me. While I may not have the courage to keep this reality before me most of the time, every molecule of my heart knows this. What is the best way to insure that "death shall have no dominion" and how best can I "rage, rage against the dying of the light"? Answer: Celebrate life and ntyself witit milsic. May I suggest that this, our final vulgarity, is the creator of ecstasy? May I ask your pardon for once again suggesting that the impulse to create musical ecstasy in our homes is the purest expression of our nobility, of our desire to amplify the life force that rises and falls with each breath we take? Can you not see that the fussing with al1 those audio gizmos is the price we pay for entering that special dimension of testicular beaudacity? It is our ability to conjure up the courage to say, "This is what my life stands forthe beauty and mystery of life matters "
That is why we are born to it and will be buried with it. Everything significant is baptized in music. As I stand over my mother's grave and throw a handful of dirt on her coffin I hear the Rabbi sing an archaic Hebrew farewell prayer. His voice is rocking back and forth weaving through time the endless rhythm of life and death, decay and renewal. As I say good-bye for the last time I feel her holding me in her arms, smiling-singing lullabies. We are bathing together in music. I am glad this is how our last moment is spent. It was our first moment. And it shall be our eternal ecstasy and I shall soon be Iying next to her in the bed of dirt, the worms nibbling at my toes. I have just adjusted the VTA of my tonearm, and the harmonics are now pertect. I am engulfed by Bartok's "Music for Strings, Percussion and Celeste," and the absurdity of this fool's life now seems quite majestic I am blessed. 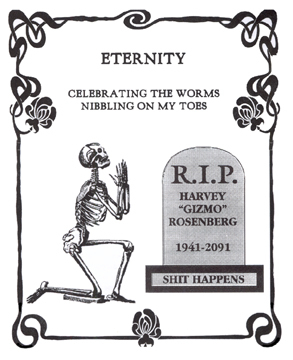 Copyright© 2006 Meta-Gizmo.com and Dr. Harvey "Gizmo" Rosenberg Triode-Guild® All rights reserved.